Providing cash flow solutions and invoice factoring to businesses in Calgary, Alberta. All cities throughout Alberta, Yukon, and Nunavut. Riviera Finance is an invoice factoring company providing the following services for companies in Calgary, Vancouver, Edmonton and all cities throughout Alberta, Yukon, Northwest Territories, and Nunavut. In January 2012, an oilfield transportation company looked at its bank account and saw its balance was alarmingly low, thanks in no small part to having dispatched a record number of its trucks to haul heavy loads under dangerous winter conditions. Another icy highway accident would have sent them scrambling for the phone to demand faster payments from its existing customers, mostly just to cover the rescue and repair bills. Rather than put their valued clients in an uncomfortable position and risk future business, the client placed an inquiry with Riviera Finance at the recommendation of a colleague. The objective was to factor a few invoices to give them enough extra cash to make it through the deep winter freeze, with no future obligations. 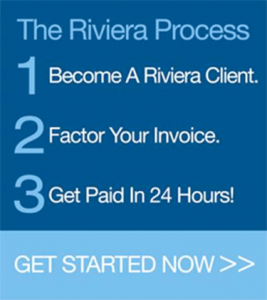 Not only was Riviera able to meet their requirements, we provided such effortless service that the client continues to use the facility as a convenient tool whenever cash gets tight, busy season or not. Since then, the client has added trucks, personnel, and even a few new accounts. For many of our clients all across Western Canada, Riviera Finance takes a lot of the stress out of the peak winter season.